The seminar that turns short-lived “dreaming” into the life-long habit of winning. "People often say that motivation doesn’t last. Well, neither does bathing — That’s why we recommend it daily. " These days you can hardly go two minutes without seeing a motivational poster describing your “potential.” Or maybe it’s some TV guru getting you fired up over how you can change the world, lose 30 pounds in two months, or improve your relationships. It’s easy to talk big but harder to follow through. It’s the same reason people love to make New Year’s resolutions but rarely stick with them beyond the first few months. Just how do you maintain the drive to change your life? Our society has become addicted to flashy fads and trends that unfortunately don’t have much staying power. The good news is that decades ago, the master of personal development gave a seminar that shared proven blueprints people could follow, day after day, to achieve their dreams with less difficulty and time. Zig’s words didn’t inspire people only for a moment; his advice affected them so strongly and provided such actionable advice that it led to thousands creating happier and more fulfilling lives. carrying over into every aspect of your life. It’s easy to think a rich life is only for people who start out with all the advantages in the world. But there are tens of thousands of people who started from nothing and became great. People like Oprah have literally gone from poverty to creating billion-dollar businesses. Do people like her have some secret advantage we can’t see? Are they just naturally better, smarter, or more driven than we are? 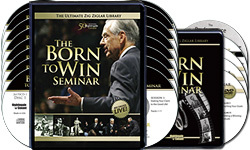 Zig knows that every single person in the world is “born to win.” It’s just a matter of unlocking the potential that has always lain within you. Easier said than done, right? Not with the right guidance found in Zig’s amazingly effective seminar. Discover your untapped greatness in two short days...or you don't pay a single penny!